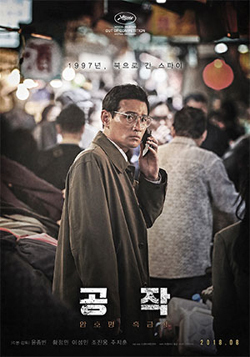 Yoon Jong-bin's latest film, "The Spy Gone North," will hit theaters overseas after its release here on Wednesday. The espionage thriller, which was invited to the Midnight Screening section at this year's Cannes Film Festival in May and received rave reviews, will be released in Asia, Europe, North America, and Oceania, starting with the release in North America this week. The film was also invited to the annual Melbourne International Film Festival, which runs until Aug. 19. Held over three weeks, it is one of the oldest film festivals in the world and the largest in Oceania. Set in the mid-1990s, the movie revolves around a South Korean secret agent who infiltrates the North to obtain information on North Korea's nuclear weapons program.